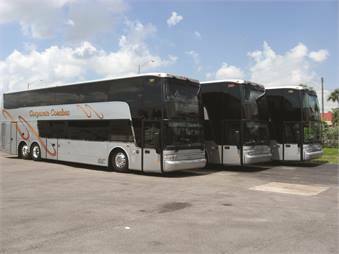 Starting out as a limousine operator, Hollywood, Fla.-based Corporate Coaches bought its first motorcoach in April 2005 to seize an opportunity and never looked back. "Some of our regular customers began requesting larger vehicles for larger groups, and we found that controlling the quality of service through buying our own vehicles was easier than giving away the work to companies we couldn't control," explains Andy Bardar, who co-owns the operation with his wife Laurie. In addition to its limousine division, the company focuses on corporate travel and casino line runs. It is the exclusive transportation provider for the Hard Rock Hotel & Casino, the Coconut Creek Casino and the Seminole Casino Immokalee. Corporate Coaches' casino business from the area's retirement communities is currently its "bread and butter," making nine runs a day, seven days a week, and transporting between 400 and 500 people a day. "The line-run service from the retirement communities to the casinos is a huge plus for us," says Bardar. "We were on board when South Florida opened up its first real casino and ended up just being in the right place at the right time." Being in the right place helped Corporate see business growth in the range of 8% to 12% from 2008 to 2010 — the three years most operators were hit hardest by the recession, Bardar says. Even as its motorcoach business has grown beyond its limousine arm, Bardar explains that it's the operation's focus on limousine-type service that has helped its work with the local retirement communities thrive. "The senior community is a hands-on type of client. They want to be catered to, they want their hands held when they get on and off the bus, they want a smile on the drivers' face and they want to feel like they are getting something special," he says. "Teaching our staff not only to do all those things the way a limousine driver would, but also, continue to strive to provide the best customer service possible, has really increased our sales." Recently, Corporate Coaches continued its growth when it acquired an operator in Orlando to expand its business to that area, one that Bardar calls the "motorcoach capital of Florida." "We do so many trips to and from Orlando that our drivers are very familiar with the city," Bardar says. "We saw there is business to be had out there, and an opportunity came about to acquire a company for a very reasonable price, so we jumped on that opportunity." To help grow that business, the operation appointed Brett Campbell as its sales representative for the area. "We're not going to run in there like a bull in a china shop. We are going to take it slow and choose our customers instead of customers choosing us," says Bardar about Corporate's strategy. The operation also enlisted the help of its bus manufacturing partner, adding five new Van Hool C2045s, which feature three-point seat belts and seating for up to 61 passengers. Since the decision to buy its first Van Hool from ABC Companies, Bardar says his operation has put its limousine business on the back burner and now has a fleet of 19 luxury motorcoaches and growing. Bardar says his decision to stick with the bus manufacturer is an easy one. "Following the purchase of our first coach, their ability to provide service and support was incredible," he says.